The Indian subcontinent is home to several deadly, poisonous snakes, including the cobra. Death due to snakebite was the most common cause of death in India until recent times. India is also well known traditionally in the west for snake charmers and rope-trick magicians. Magical cure for snakebites is still practiced in remote areas of India. Ancient Indians both feared and revered the snakes. The tradition still continues. Hindus worship snakes in temples as well as in their natural habitats, offering them milk, incense, and prayers. In Christianity a snake symbolizes evil or Devil. In Hinduism the symbolism is much more complex. In Hindu ritual and spiritual tradition, a snake is not an evil creature but a divinity representing eternity as well as materiality, life as well as death, and time as well as timelessness. It symbolizes the three processes of creation, namely creation, preservation and destruction. 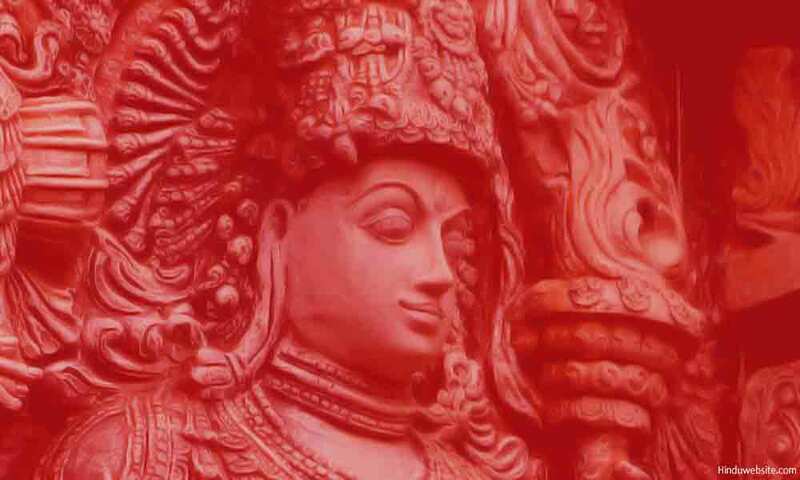 You will find references to snake deities in both Hindu folklore and literature. It is possible that Indus people worshipped snakes. They are also popularly associated with both Vishnu and Shiva and several other divinities, including Indra, who rides an elephant called Nagendra, the lord of the snakes, which is probably a reference to Indra's control over the snake world. 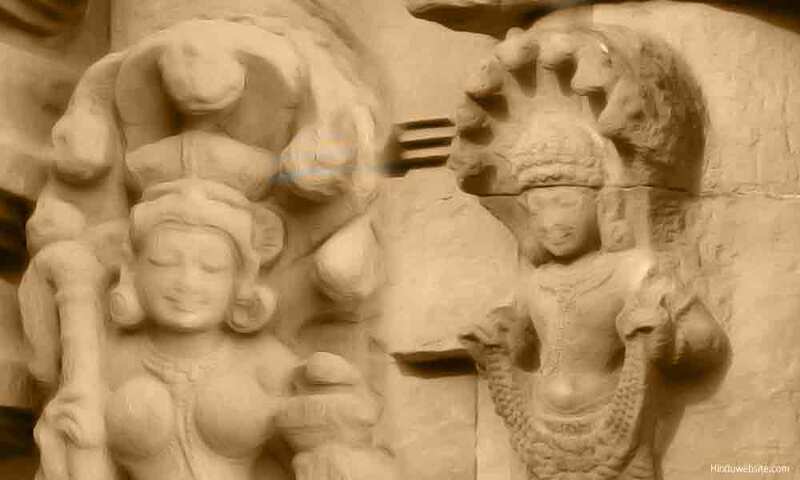 The Puranas mention several large serpentine deities like Kadru, Manasa, Vinata and Asitka. Vasuki the king of snakes, played a vital role in the churning of the oceans. Several myths, beliefs, legends and scriptures are associated with snakes. Snakes were used in warfare and snake poison was often used in palace intrigues. The following are the most common symbolic descriptions associated with snakes in Hinduism. In the Bhagavadgita, Lord Krishna says, "Among the serpents I am Ananta." Ananta or the Adisesha is the infinite divine snake with its endless coils floating in the waters of creation, upon which Narayana (Brahman) rests. Ananta represents the infinite eternal materiality or primal energy (mula-prakriti). Upon activation, a small part (amsa) of it differentiates into subtle (suksma) and gross (suksham) realities (tattvas) which combine to manifest as the whole diversity we experience through our senses. 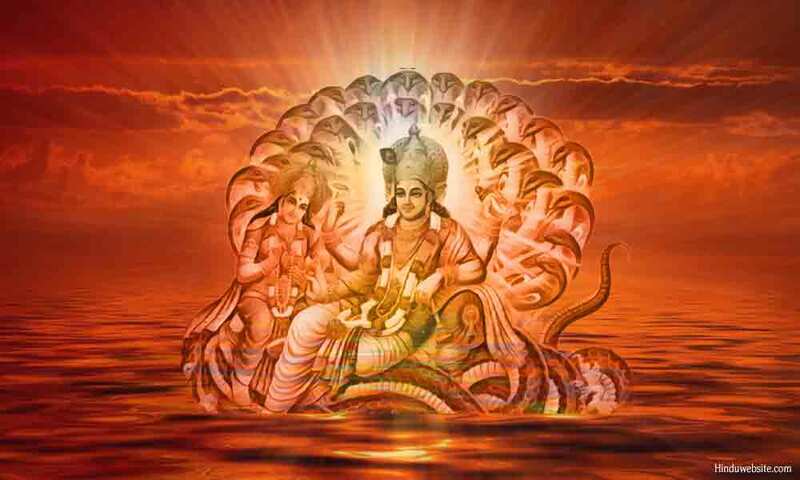 The serpent below Vishnu is the primal Prakriti. The Lakshmi above, sitting at the feet of Vishnu, is the activated Prakriti. The waters or the ocean upon which all this floats represents avyakta Brahman or Unmanifested Brahman. In a spiritual sense, snakes represents desires. Just as those who are bitten by snakes are vulnerable to suffering and death, those who are bitten by desires suffer from the cycle of births and deaths. The suffering inherent in the phenomenal existence is compared to snake poison. You are safe only when you hold that poison in your throat like Shiva and do not let it go into your body or mind. Pasas, the snake like ropes of attachment, are transformed desires, which keep people bound to their karmas. 3. Sacred thread and divine ornaments. 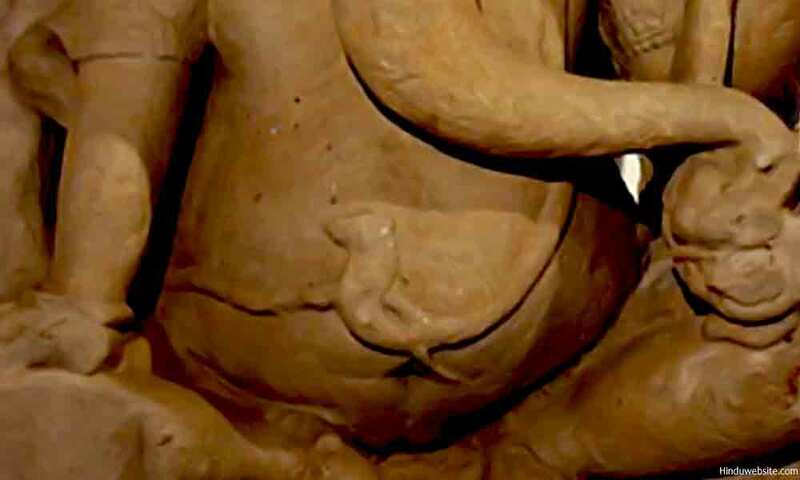 In the images of many deities, such as Ganesha, snakes are depicted as the sacred thread (upavitam) worn around the body. The thread in the form of snake represents purity (sattva) of the body, knowledge of the Vedas, perfection in speech, and self-control. In the iconography of Saivism, snakes also serve as ornaments for the gods and goddesses..
Ganesha wearing snakes as the sacred thread and ornament. Kundalini or the sexual energy hidden in the muladhara chakara is compared to a coiled snake. 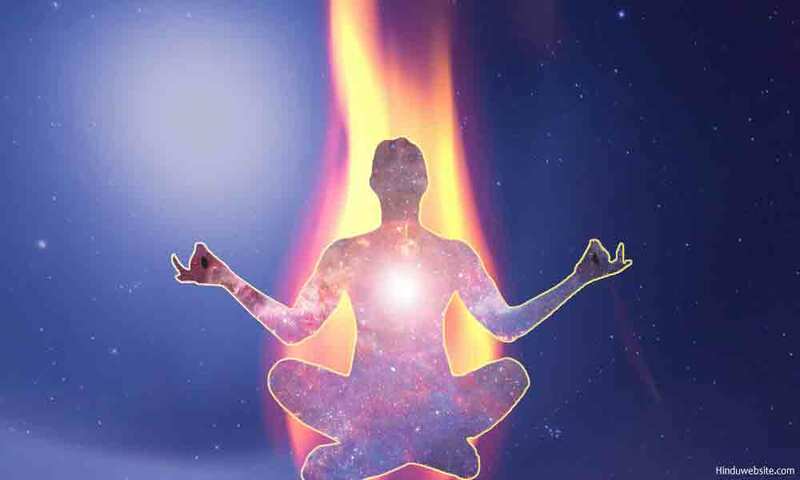 When the body is subjected to austerities and purification through celibacy and other practices, the heat (tapas) generated in the process activates the kundalini. 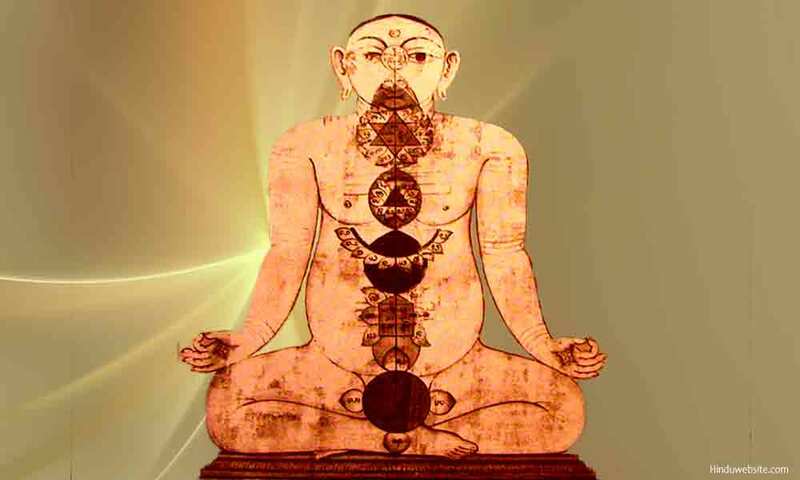 Then, like a coiled serpent it ascends gradually through the higher chakras until it reaches the highest chakra, the Sahasrara, whereby a yogi experiences enlightenment and the highest bliss. In Hinduism there are three types of energies, creative energies represented by rajas, preservation energies represented by sattva, and destructive energies represented by tamas. They are also known as the centripetal, balancing and centrifugal forces of the universe. All motion and activity in the universe arises from them. Since the snakes are responsible for death and destruction of humans and animals, they are compared to the destructive tamasic energy represented by Lord Shiva himself as the destroyer. . 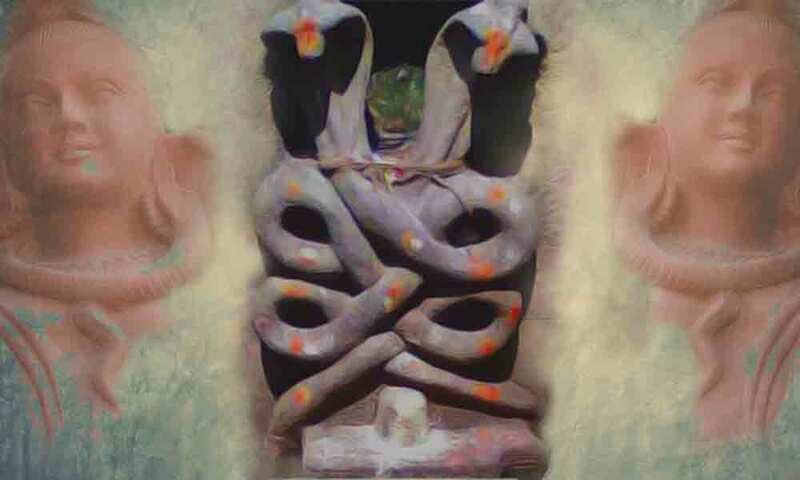 The Shivalinga at the base denotes the association between Shiva and the snakes. Both represent the destructive tendency in Nature. Like a snake, speech can hurt, cause pain and suffering and even unleash death in the form of curses and magical chants. The snake adorning the neck of Shiva represents the power of the venomous speech. The source of the speech is the throat where Shiva holds the poison (poisonous speech) and prevents it from getting out and hurting others. The forked tongue represents double talk or deceptive speech. The forked tongue of the snake represents double talk and the poisonous teeth symbolize biting, hurtful speech. Since snakebites bring misery and adversity to families through the death of cattle or family members, snakes are associated with bad luck or misfortune. 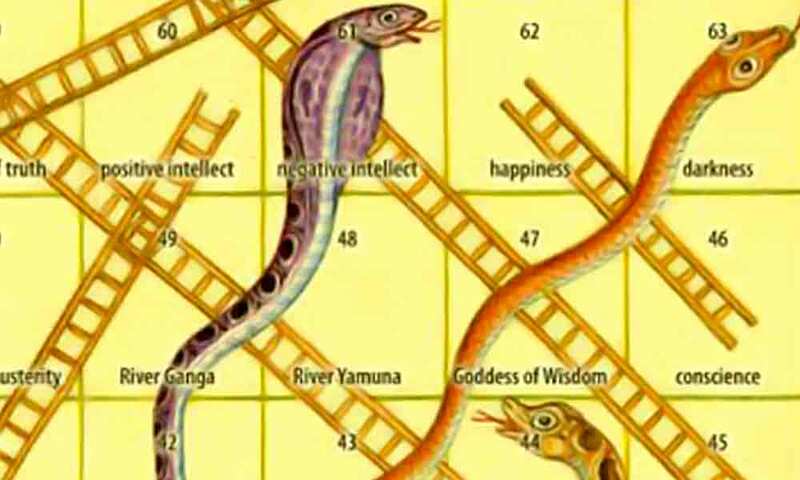 This is well illustrated in the game of snakes and ladders which was invented in ancient India. Snakes and Ladders, a game of fate and chance, originated in India. Hindu scriptures mention Nagas, who are a class of demigods or semi divine beings who live in the subterranean world, known as Patala. They protect the treasures hidden in the earth and have the ability to assume human form. By nature they are good, but they can become destructive and vengeful if disrespected or not treated well. 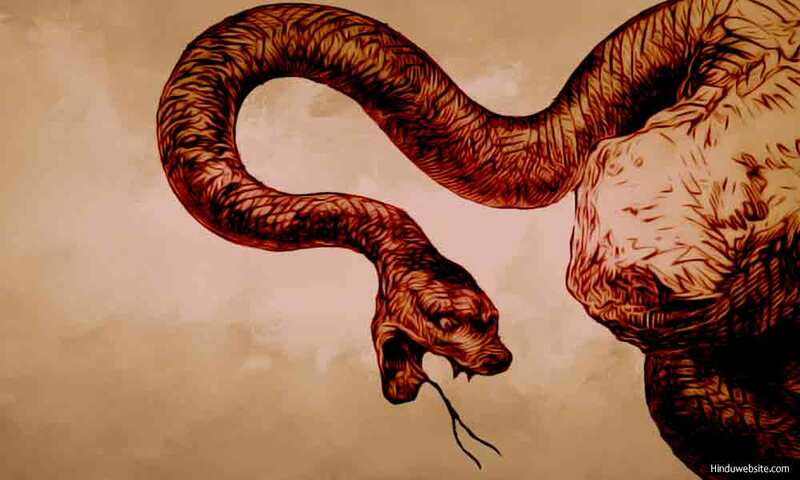 Hindus believes that certain types of curses and spells arising from aggrieved snake deities can result in death, sickness, misfortune, loss of progeny, or childlessness, for which one has to perform purifying and expiatory rites. 9. Kala, death or time. The snakes represent death, unexpected death or death arising from misfortune. 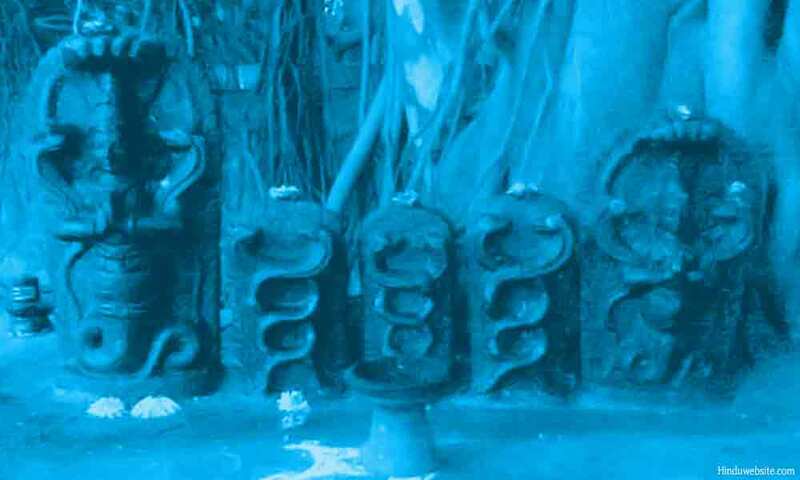 The Vedas extol Rudra or Shiva as the healer, the god of medicines who protects and rescues his worshippers from death and destruction caused by snakes and snakebites. Snakes are symbolized as destructive and deadly arrows used in warfare. Hinduism considers our world a manifestation of Death (Kala) who is also known as Time. Kala devours everything. All existence for Him is food. Snakes symbolize Kala and thereby time. Kala, the Lord of the mortal world. is also the lord of Death and Time. The whole world is his food. The world naga is often used in Hindu texts in reference to the outward breath (apana) or that which is expelled through the mouth and other apertures in the body as in case of a burp. Just as a snake moves in the passages below the earth, apana moves in the body through various channels and exists through the holes in the body. Just as the outward breath escapes through the mouth, snakes also occasionally come out of their subterranean passages through the holes in the ground and show themselves up. As the leader of the sense organs prana distributes food to all the organs. Since it is the personification of Death itself, it is eternal and indestructible. The word naga is also used in Hindu literature to refer to distinguished persons (nagadhipa), certain place names, names of superior or semi-divine elephants (nagendra), female elephant (naganjana), a particular group of Saivite ascetics (nagababas), Ganesha (naganana), a womb related disease, a fragrant flower bearing tree (nagakesara), the name of a constellation (naganaksatram), chemicals (nagajam), precious stones (nagamani), festivals (nagapancami), flowers (nagamalli), names of trees, elephant catcher (nagabandhaka), a subterranean world (nagalokam), a snake maiden (nagakanya), and so on. I am not sure whether the words Nagara and Nagarika, meaning town-bred or civilized, have any relation with the word naga, but they seem to have a common origin. However, Hindu Puranas describe both male and female nagas as very charming and beautiful as the following image of a naga queen suggests. It is possible that there might be a connection between the ancient Indians and the ancient Indian tribes of Americas, since the American Continent was like the subterranean world for the people of the Indian subcontinent, being on the opposite side of the globe.